Haul – Freeman, LUSH, ghd, Sorbet, The Body Shop & More! I cleared out my hair care & body care collection just so I could add more to it….where’s the logic in that? Clearly all common sense goes out the window once I go nosying around Dis-Chem. The last 2 months have been very good for beauty buys – Retail Box had an epic sale back in January and Dis-Chem stores always have unbeatable prices. I usually tweet & Facebook post about sales & discounts on my social media accounts, so be sure to follow me here and here. Today I’m showing you what made it into my shopping basket (both in-store and online). Truth be told, I’ve gone a little mad on the face mask front, plus I found a makeup brush shampoo that might just replace my beloved Beautyblender Solid Cleanser. I also stocked up on some bath & body care goodies for the colder Autumn / Winter months ahead. As with most of my hauls, this one started off with a single innocent purchase (a lonely little Freeman face mask) that spiralled into a fully fledged raid of Dis-Chem. This confirms I probably shouldn’t be allowed to step foot in any Dis-Chem store without adult supervision. In my latest video I give you all the dirty deets on what I’ve been purchasing these last few months (pricing of each item is indicated on the screen whilst chatting about the product), PLUS I give a short review on a couple of the products as I have started testing a few of them (2 products received a thumbs down from me). As always, I’d really appreciate it if you could share my video with your friends on Facebook & Instagram and leave a comment on the video (especially if you saw something that piqued your interest). Next video will be a makeup tutorial or ‘Get Ready With Me’ – be sure to subscribe to my channel so you don’t miss out! P.S. This video was sponsored by my bank account – haha! Oh, and have you entered my Blog Birthday Beauty Hamper GIVEAWAY yet? If not, why the heck not!? It’s awesome! Thanks, Missy! 🙂 I have really been enjoying the ghd hairdryer, it really does cut down on drying time. 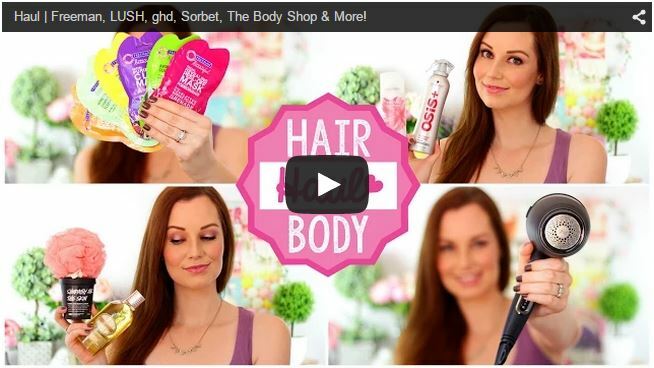 I have an insane amount of beauty products and watching these blogs makes me want more. My solution was to give all the products I didn’t love to my sister to make space for new ones to try. Let’s just say that I totally get where you are coming from….. Your make up looks so pretty in the video. I’m pretending I haven’t read this post or watched the video, I just spent a ridiculous amount at Dischem over the weekend, if I go back I’m pretty sure they’re going to send me to beauty-holics rehab… and you’re not allowed to wear makeup there!!!! Those freeman masks look so good – defs going to try! So far, I have been super impressed with the products that I have purchased after seeing your reviews. Thank you for being honest about the products. You look gorge in the video, Lu! I’m getting the dry conditioner and face masks for sure, thank you for always introducing us to new and interesting things. STOP IT! My money has wings because of you LOLOLOL! Just returned from Dischem. Totally raided the Freemans section. I felt very lost in the shop (Im more of Clicks shopper out of comfort-its nice knowing where everything in the store is). The sales people at Dischem looked at me like I was crazy while I profusely hunted for these face masks! Cant wait to try them! I got the honey dew, pomegranate and apricot. Yay! Shoot! I forgot the face wipes! (Urgently makes U-turn). This blog is bad for my pocket! I used to be more of a Clicks kinda gal but ever since Dis-Chem started stocking unique brands such as Morgan Taylor, L.A. Girl & Freeman, I’m visiting their stores A LOT MORE OFTEN! 😉 I usually just walk through each aisle in Dis-Chem, scouting for new & exciting products…I never just walk into the store and head straight for a certain shelf. I love just walking around, checking everything out – haha! Garnier has the best face-cleansing wipes I have ever tried. D’Avines hairproducts that you buy at Carlton hair are by far the most yummiest smelling and the scent lingers all day long. I had such a chuckle when you said your hair smells like a wet dog :-)). I was a bit disappointed with the no 10 Secret Box of Retailbox.co.za. The previous ones were so amazing, but this one is really disappointing. I will not mention what is in it, as not to spoil the secret for anyone. Do you have any idea when Lush Jhb are going to open, as it is quite pricey for our Gauteng girls to order their stuff online. Thanks again for the BEST BLOG EVER!!! I have actually never tried any Davines hair care products, will definitely check them out next time I walk past a Carlton Hair salon. I didn’t buy the Secret Box 10 this time around, I have so many hair care products that I need to work my way through before I’m allowed to purchase any more products or subs boxes.